Being a well established organization, we bring forth an impeccable array of With or Without UV Stabilizer Bag that is stringently examined by our skilled quality controllers on various parameters to meet varied needs of our clients. 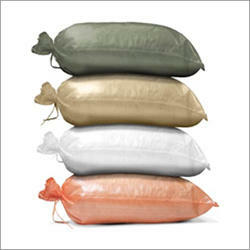 Our customers greatly trust the offered bag for its associated features like chemical and odour resistance nature. Apart from this, it is available at pocket-friendly prices in numerous sizes to our clients from every nook and corner of the nation. Incorporated in the year 2010, at Rajkot (Gujarat, India), we, “Slogan Polypack Pvt. Ltd.”, have uniquely positioned ourselves as a prominent manufacturer, exporter and supplier of an exclusive assortment of PP Woven Fabrics, PP Cement Bags, PP Fertilizer Bags, PP Agro Packing Bags, Polypropylene Bags, PP Woven Sugar Bags, Woven Bags Sacks, Leno Mesh Bags, Liner Bags, Sand Bags, BOPP Laminated Bags, etc. The products offered by us are manufactured using optimum grade raw material and the latest machines in complete compliance with the set international quality standards. These products are highly appreciated by our esteemed clients for their unique features such as temperature resistance, lightweight, durability, smooth surface, moisture proof and easy to carry. The products offered by us are stringently examined against various parameters of quality under the inspection of our skilled professionals, in order to eradicate the any sort of production defects. In addition to this, offered products are available in various sizes and capacities and can be customized in various options as per the variegated requirements of clients. Clients can avail the entire assortment from us at competitive market prices.